Today is going to be another food related post and also is perfect for Organic September which I touched upon yesterday. Pana Chocolate was founded by Pana Barbounis in Australia with the intention of creating a rich luxurious chocolate the world could enjoy. The chocolate is made from vegan organic ingredients with no refined sugar and produced using minimal heat (raw). Why raw? Cacao processed at high heats (like in most chocolate) loses its nutrient value and can cause a build-up of acid in the body. Pana Chocolate uses a consistently low temperature to create non-acidic chocolate that retains its naturally occurring nutrients and antioxidants. By choosing raw chocolate you are getting all of the benefits of the cacao bean which is the most antioxidant rich food source known. Also a few notes from the environmental side, Pana Chocolate ingredients are 100% certified organic and farmers are paid a fair price for their products. The eco-friendly packaging is made from 100% recycled materials with biodegradable foil wrapping, vegetable based inks and an edible plant gum seal. Now on to my thoughts! I have tried both the mint and the fig & wild orange flavours so will talk a little about each of those. The mint flavour is made with 60% cacao and pure essential peppermint oil to boost your energy levels and for me is perfect as a morning snack as a little pick me up when I'm in the office. The flavour is a lovely sweet mint chocolate perfect for satisfying sugar cravings and is truly delicious. The fig & wild orange flavour is made with 70% cacao and has a difference texture due to the addition of figs which are nice and chunky and you get a hint of the orange flavour which blends really nicely. This flavour is lovely and creamy and the figs are rich in antioxidants, calcium and fibre making it a great raw vegan treat and the essential orange oil also has anti-inflammatory properties. 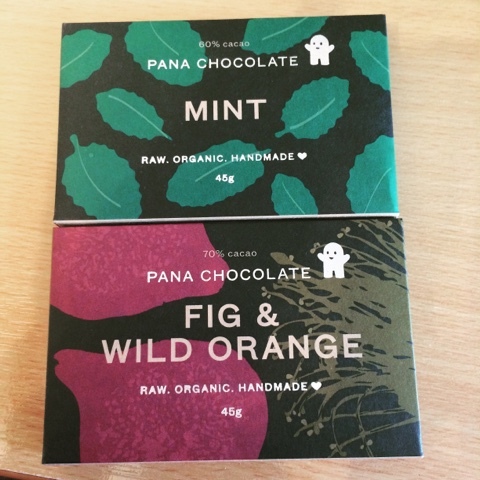 Each pack (45g) retails at £3.20 and is available via the Pana Chocolate online shop. I hope you liked this post, I have to say that I am having quite a ball testing out these organic goodies (it's not all within one sitting though I promise!!). If you want to see more let me know in the comments below and you can read all about Pana Chocolate on their website http://www.panachocolate.com/.